Iranian president Mahmoud Ahmadinejad may be headed to space one day, if a recent public statement is to be believed. Speaking at an exhibition of Iran's space achievements in Tehran, the Islamic Republic's president said he would be the first human launched to space aboard an Iranian rocket, the Mehr news agency reported. "I am ready to be the first human to be sent to space by Iranian scientists," Ahmadinejad said. The comment came just a week after Iran launched a live monkey into space inside a capsule named Pishgam ("Pioneer" in Farsi), which was lofted aboard a suborbital rocket. "Sending living things to space is the result of Iranian efforts and dedication of thousands of Iranian professional scientists," Ahmadinejad said, according to the Mehr news agency. 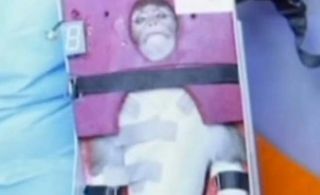 Iranian officials said the monkey's launch was a scientific precursor to sending humans to space, though international experts have been skeptical, worrying that the same rocket technology used in these experiments could be applied to launch ballistic missiles carrying nuclear warheads. Ahmadinejad dismissed those concerns and said Iranian scientists should be on the lookout for international sabotage efforts on its space program, according to the Mehr news agency. "We should admit that some [powers] do not tolerate Iranian greatness and growth. Iranians [have] incited devils' hatred by Iranian idealism, perfectionism, and being human," he said. If Ahmadinejad does eventually go to space, he will not be the first Iranian to do so. That distinction is held by Iranian-American engineer and entrepreneur Anousheh Ansari, who paid to visit the International Space Station aboard a Russian Soyuz spacecraft in 2006. She was the first, and so far the only, female space tourist.